+ Men’s, women’s and mixed events in Open and Restricted Age categories. + Only same-affiliation school alumni crews may participate. + All rowers are welcome, whether long-experienced or new to the sport. The Alumni Sprints does not require participants to have actually rowed for their alma maters. Vesper Boat Club is hosting a book signing by our 1964 Gold Medal Olympian, Emory Clark, who will sign copies of his newly published book Olympic Odyssey. Emory trained at Vesper after graduating from Yale. The book signing is 1 pm till 3 pm. Free Admission. 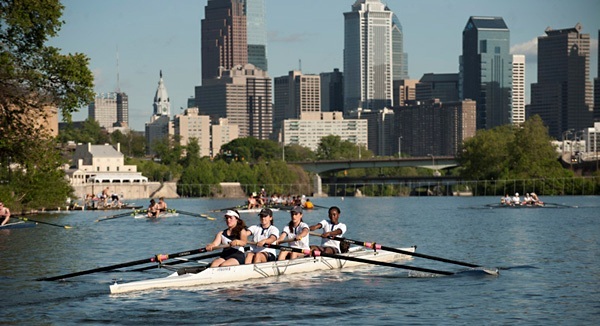 10 Boathouse Row (215) 769-9615. Intense physical and emotional exertion turned one man’s dream into reality. Clark brings his picaresque journey to life with intimate details, insightful commentary and humorous asides that come from a life-long love of competitive rowing and the perspective gained from reaching a pinnacle in the world of sports. If you have any questions, please contact Dale Parenti at 215 219 7274 or dale@dparentidesign.com.